Standing on the bridge and looking down on the stream you may not be aware of the history flowing beneath you. The stream starts at the top of a mountain and runs wild through the Ozark wilderness carrying stories and connecting generations. The stream is sacred to the locals. They know it as War Eagle Creek. 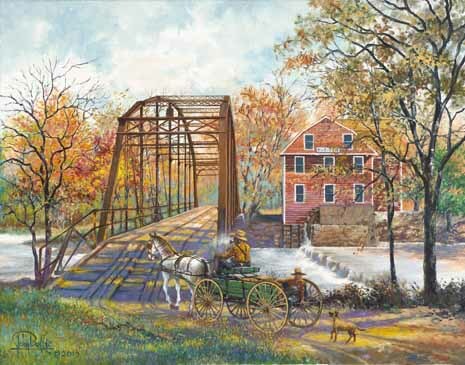 Painting of War Eagle bridge and mill by John Bell, used in the film "Bridge to War Eagle". War Eagle Creek is an important community resource. It begins at the same hilltop source that feeds the White River, Kings River and Buffalo River, and Big Piney and Mulberry Creeks. It runs for 59-miles starting from its home in the majestic hardwoods of the Ozark National Forest and journeys to its end at Beaver Lake where it provides water for all of Northwest Arkansas. There are some Ozark folks who understand that War Eagle isn’t just a water source. It is a storyteller and one of the oldest stories it carries gives insight into its name. It is believed that the stream’s namesake was a young Cherokee man who tragically lost his life while trying save the life of the women he loved after she had been kidnapped by a trapper. In a new documentary film, Bridge to War Eagle, viewers discover meaningful stories carried by this beloved Ozark mountain stream. The film introduces the folks who use it and lovingly protect it intuitively knowing that viewers will fall in love the stream too. Created by the Emmy Award winning team of Larry Foley and Dale Carpenter, Bridge to War Eagle is narrated by country music star Joe Nichols, who also has personal connections to War Eagle. It is an honest film that will leave you with a deeper understanding of the elements and stories that render the Ozark landscape and its people so endearing. See “Bridge to War Eagle” on AETN on August 11th at 6:30pm or learn more about the film on the official “Bridge to War Eagle” website and watch the making of the documentary film. War Eagle Creek is a great float stream. Considered a Class 1 or easy level stream, a float trip six miles long will take about three to three and a half hours to paddle. The creek is generally floatable from March to mid-June, depending on the amount of rain received in the region. Referred to as a “miniature version of the Buffalo National River” it is a scenic trip through unusual painted bluffs and flows north (other area creeks flow south). Fishing is also great on War Eagle Creek with catfish, bream, perch and bass and stream-running walleye. The creek flows through Withrow Springs State Park which has three hiking trails, including the War Eagle trail, a trail that follows the bluff line and opens up to views of the surrounding valley and creek below. Near the trail is War Eagle Cave, which is home to several bat species. Deer and foxes, wild turkeys, groundhogs and bobcats, wood ducks, river otters, pileated and other woodpeckers and kingfishers are some of the wildlife that can be spotted near War Eagle Creek. In 1832 the Blackburn family built a grist mill on War Eagle Creek. Enduring floods, a civil war and more than a century of challenges, War Eagle Mill secured its place in history. Still in operation today, it is in fact the only working mill in Arkansas, and it is still powered by an eighteen-foot cypress waterwheel which is believed to be the only undershot water wheel currently in operation in the United States. See the mill in operation and purchase goods made the way they used to be at War Eagle Mill. Peruse the War Eagle Mill Catalog or find recipes. The mill is also known as the home of the War Eagle Craft Fair held in the Fall (2nd Thursday in October) and Spring of each year. Read more about the War Eagle Craft Fair or visit the Official Calendar for Eureka Springs to see other events in the region. Built over War Eagle Creek in 1907, the iconic single lane bridge is the only Parker truss bridge (also known as a camelback bridge) in northwest Arkansas. With a span of 182 feet, the stone range work pier and abutment on the eastern end and wooden planking for the bridge flooring were built with local resources. War Eagle Bridge completed restoration in 2010 and is on the National Register of Historic Places. See photos of the restoration. The Little Golden Gate Bridge in the Town of Beaver, Arkansas. 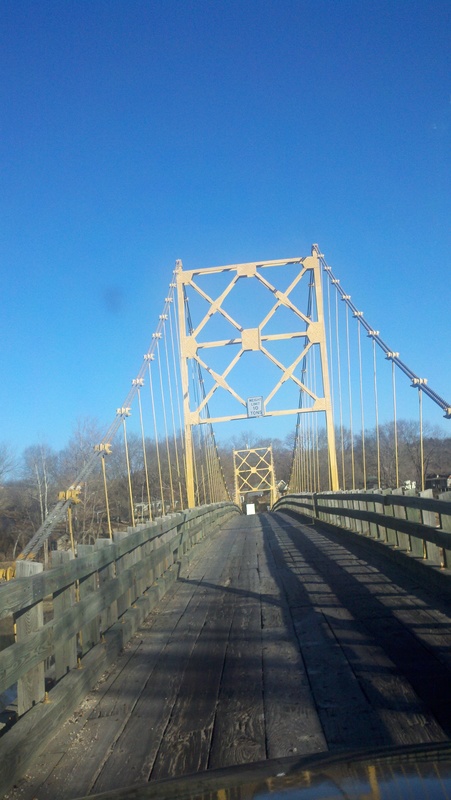 One of several historic bridges in Arkansas. Arkansas is home to several picturesque historic bridges recognized by the National Trust and listed on the National Register of Historic Places. (See vintage postcards of some of Arkansas’ historic bridges.) Visit the Little Golden Gate Bridge located in Beaver Town. From Eureka Springs just follow Highway 23 North to Highway 187. The Little Golden Gate Bridge crosses the White River at the Town of Beaver. Take photos, visit the historic pump house, walk the bluff trail that follows the river, or float up the river to see Heron Island and other features on the White River. You can feel Ozark history come alive as you walk the wooden planks of a historic bridge and look out over the same views as people have done for more than a century. See War Eagle Creek for yourself. Just a short drive from the quaint mountain town of Eureka Springs, Arkansas. Take Highway 23 South. Visit the historic Town of Beaver. 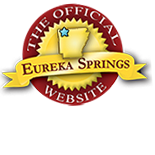 Eureka Springs, Arkansas is ideally located near War Eagle and the Town of Beaver and is a destination all on its own. Find great places to stay and things to do while in the area. This entry was posted on August 9, 2011 by estcblog in History, The Great Outdoors and tagged beaver lake, bridges, history, local culture, movies, Outdoor, Ozark National Forest, white river.